Woohoo! Congrats on signing up for our Review Monitoring service. The first step in getting started is checking your email. You should have received an email notification with login credentials for your account. 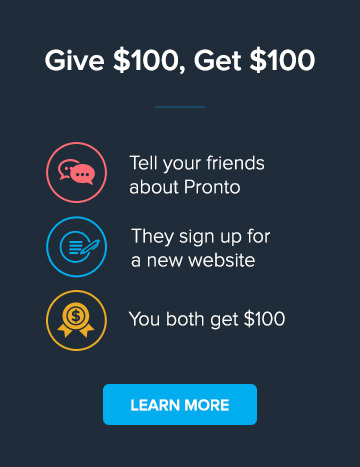 Head over to reviews.prontomarketing.com and sign into your account. You'll be able to change your password after you login for the first time. Once you log in, you'll be taken to your dashboard which gives you an overview of the reviews across all your listings. If you're logging in for the first time, you might not see any data here yet. It can take 24-48 hours after we create your account before our system is able to gather and display data about all of your reviews. On your dashboard, you'll be able to see information about where people review you the most, your aggregate rating across all your listings, your ratings across separate listings and how many reviews you gained in the last several months. This tab allows you to view individual reviews that you have received. If one of your reviews needs some special attention, click to the “Respond” button to be taken to the page where you can write a response to that reviewer. On this tab, you can request reviews from happy clients directly from our platform. Select one of the email templates and then choose which listings you want to direct your clients to. You can send requests to individual clients or multiple clients at the same time. However, we recommend sending individual requests and adding a personal touch to the template you've selected. This will increase the likelihood that the client will follow through on your request. You also don't want to send too many review requests at one time because many directories have review filters in place that will make some reviews as spam if you get too many new reviews within a short time period. It’s a good idea to give your clients a few of your listings to choose from. For example, many people don't have Yelp accounts so including a few other listings gives them some alternative options. The ability to change you password and adjust your email alert settings can be controlled through the account settings tab. By default, email alerts are set to be delivered immediately after any review is completed on any of your listings. You can edit this or add new alerts by going to the Alert Emails tab. You can customize your alerts to be delivered daily, weekly or monthly. You can also choose to only receive alerts for positive, neutral or negative reviews. That’s about all you need to get started! If you have any questions about our Review Monitoring service, please don't hesitate to contact us. Now, go get some 5 star reviews!